The head security guard was called that Thursday morning as Greg and I prepared to enter the New York Public Library exhibit of Jack Kerouac's "On the Road" scroll. She was adamant that I could not record my public radio audio diary. I showed her the business card of the associate director of public relations but she was unmoved. I forgot my press credentials, but she said that wouldn't have helped. We chatted for some time and I learned she was from Selma, N.C. "What are you doing up here with all this cold weather and rudeness?" I asked her. She laughed. Within a few minutes, she said, "If you'll work with me, I'll work with you." We were on. I stepped into the exhibit hall and, well, swooned. The 60-feet of scroll was unrolled in a long, narrow case that led to a giant picture on the back wall of a highway. It appeared the scroll was itself a road, part of this asphalt one, and each connected by sheer length. The scroll, hundreds of words, and the pavement, hundreds of white lines. Rather than starting in order ... and risk losing my clear thinkingness on notepads and jottings ... I began with the scroll itself. I stared for I don't know how long at the first paragraph. I read the first line over and again (find it here), looked at the typewritten letters one at the time, watched for penciled edits. I simply drank in the paper, as if I were sitting with Kerouac himself and he was telling me, "Now here's where I started, you see I was drinking lots of coffee and had been working on this thing for years in my mind, and one afternoon I knew it was time to get started, and my girlfriend had this long architect's paper in her closet, left over from an old boyfriend, and I taped those long sheets together to make a roll so I wouldn't have to stop thinking and writing to reload the typewriter." After about an hour with the scroll, I must have come to my senses and noticed Greg, who was a dedicated reader and examiner of each item in the exhibit. I felt a little superficial in comparison. I went into the large hallway outside the exhibit room and recorded some thoughts for my public radio audio diary, then went back in. Still not starting at the beginning, I went next to his notes for "Some of the Dharma," the long book he wrote about Buddhist thinking for Allen Ginsberg. Never printed in his lifetime, the pages were printed about 10 years ago, just as he designed them, with his drawings and typographical designs -- poems in pyramids, haiku in neat boxes. At this point, I've seen only about 5 or six of the 300 items on view. I go out for air, and noticed that we've been at the exhibit already for two hours. AHEAD: Kerouac's time as a fire lookout on Desolation Peak in Seattle, Wash., along with time in Rocky Mount, N.C. (my hometown) and Kinston, N.C. IMAGE: Jack Kerouac. 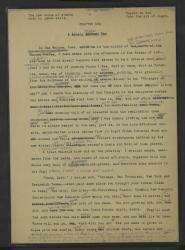 Private manuscript copy of "Gone on the Road," the first page of the typescript of an early version of "On the Road," written in August–September 16, 1950. From the New York Public Library Berg Collection and reproduced courtesy of John G. Sampas, legal representative of the estates of Jack and Stella Kerouac. This is awesome. You are conveying -- effectively, infectiously -- your excitement at seeing this scroll. A modest request: At some point, perhaps you might pause and tell us why this scroll means so much to you ... when you first discovered Kerouac, why his work means so much to you, where the rest of us should begin to experience him. In the meantime, brava!